Egyptian Defense Minister Abdelfatah al-Sisi on Egyptian state TV delivering a statement on July 3, 2013. The military issued President Morsi an ultimatum before deposing him in a coup. 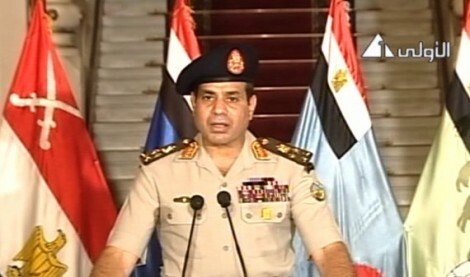 Egyptian Defense Minister Abdelfatah al-Sissi on Egyptian state TV delivering a statement on July 3, 2013. The military issued President Morsi an ultimatum before deposing him in a coup. There are diametrically opposed interpretations about what is taking place in Egypt. One fact remains certain, however. In 1952 during the overthrow of the monarchy, and in 2011during the overthrow of the dictatorship, and in 2013 during the overthrow of the newly elected government, the military was the ultimate power. It has no intention to forego that power regardless of the outcome of the next election in 2014. President Mohamed Morsi of the Muslim Brotherhood (MB), the candidate of the Freedom and Justice Party, remains in jail (or “incommunicado, as the media prefers), along with other imprisoned former government functionaries and MB followers. Most are awaiting trial on a variety of charges, as though it was the Brotherhood that launched the coup. Some 250 people, almost all of them Morsi supporters have been slain by military and security forces when they demonstrated against the coup. The protests are continuing, and the military crackdown is becoming increasingly fierce. A review of dozens of U.S. federal government documents shows Washington has quietly funded senior Egyptian opposition figures who called for toppling of the country’s now-deposed president Mohamed Morsi. Documents obtained by the Investigative Reporting Program at UC Berkeley show the U.S. channeled funding through a State Department program to promote democracy in the Middle East region. This program vigorously supported activists and politicians who have fomented unrest in Egypt, after autocratic president Hosni Mubarak was ousted in a popular uprising. The State Department’s program, dubbed by U.S. officials as a “democracy assistance” initiative, is part of a wider Obama administration effort to try to stop the retreat of pro-Washington secularists, and to win back influence in Arab Spring countries that saw the rise of Islamists, who largely oppose U.S. interests in the Middle East. Activists bankrolled by the program include an exiled Egyptian police officer who plotted the violent overthrow of the Morsi government, an anti-Islamist politician who advocated closing mosques and dragging preachers out by force, as well as a coterie of opposition politicians who pushed for the ouster of the country’s first democratically elected leader, government documents show. President Obama has proclaimed neutrality in this matter and seems to have positions himself above the conflict, but Washington’s every practical deed has been supportive of the military and the military-dominated interim civilian leadership. President Obama refused to characterize the overthrow as a coup, which of course it was, because to do so would legally terminate the annual bribe of $1.3 billion to the Egyptian armed forces — a token of America’s gratitude for maintaining good relations with Israel. On July 31, U.S. Defense Secretary Chuck Hagel announced that the Pentagon would participate in mid-September war games with the Egyptian army as its had done throughout the years of dictatorship. The U.S. and several countries, mostly western, are leading a very public “reconciliation” campaign essentially aimed at of convincing the leadership of the MB to capitulate, accept the overthrow, end the protests and “swallow the reality” of defeat. It is being portrayed as a peace effort, with no criticism directed toward the military that broke the law and evidently future jail terms for some MB leaders, including Morsi, who didn’t. Clearly, it is just a matter of time—an “I” to be dotted, a “T” to be crossed—before Obama and Sisi will embrace in public. A curious anti-Morsi coalition—a seemingly unprincipled amalgam of left, center and right, each with somewhat different agendas that they expect to advance by liquidating the Islamist government—has galvanized behind the military junta and is following its “roadmap” to the next elections. Most anti-Morsi organizations, including groups affiliated with the National Salvation Front, joined pro-military demonstrations July 26 called by Gen. Sisi himself to provide an additional popular mandate for increasing the suppression of “violence and terrorism,” primarily to crush continuing Brotherhood demonstrations. The interim cabinet declared: “Based on the mandate given by the people to the state … the cabinet has delegated the interior ministry to proceed with all legal measures to confront acts of terrorism and road-blocking.” The MB has not perpetrated any acts of “terrorism,” so the reference must have been to the Salafi struggle for power in Sinai. Road-blocking refers to two large long-lasting sit-down protests in Cairo by anti-coup forces.